Use the Ladder Selector below to navigate to specific information on your ladder of interest. With over 100 to choose from, FDS offer the most extensive range of assault ladders in the industry. All ladders pass through an extensive destructive testing process to determine the initial distortion and catastrophic failure points. This information is provided on the relevant pages below. FDS manufacture a range of Combination type assault ladders for both vehicle based systems and standard ground use applications. The ladders consist of a multi-level base and sliding section, to which different length sections can be added to, to form a longer ladder. FDS manufacture a range of multi-level standard duty lightweight Portable extension ladders designed for Special Operations use. The ladders are fitted with full length nylon slides to reduce noise and are supplied as standard with sliding section Velcro straps. FDS manufacture a range of multi-level heavy duty team entry extension ladders designed for Special Operations type uses. All ladders are triple stile and fitted with full length nylon slides to reduce the noise and are supplied as standard with sliding section Velcro straps. Low Level Ladder Platforms are designed to both assist the entry into low level targets and to provide a stable platform to work from. 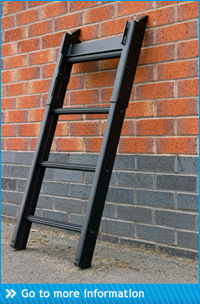 The ladders are ideal for entering ground floor windows, buses, coaches and railway carriages. The platform is fitted as standard with high grip rubber feet at the top and bottom contact faces. The marine boarding ladder was developed for British Armed Forces to enable Royal Marines to board ships under way for cargo inspections. The equipment which is now used by Military, Police and Custom’s Officers is constructed with a sealed aluminium upper section and a flexible shock resistant lower section is available to prevent damage to the RIB. FDS manufacture a wide variety of sectional ladders in standard width, double width and triple stile patterns. The sectional ladders consist of a standard base ladder and middle / top sections which are connected by a heavy duty nylon lined channel system complete with a detent locking pin. FDS manufacture a wide selection of single section ladders in single, intermediate and wide types including triple stile. Thirty five standard ladders are currently available in lengths up to 4.0 m long.